A Harvard study published March 3, 2016, in JAMA Oncology adds to increasing evidence that aspirin use may help stave off colorectal cancer and suggests that aspirin is also associated with a small reduction of overall cancer risk. Researchers looked at aspirin use among almost 136,000 men and women in two studies over 32 years. 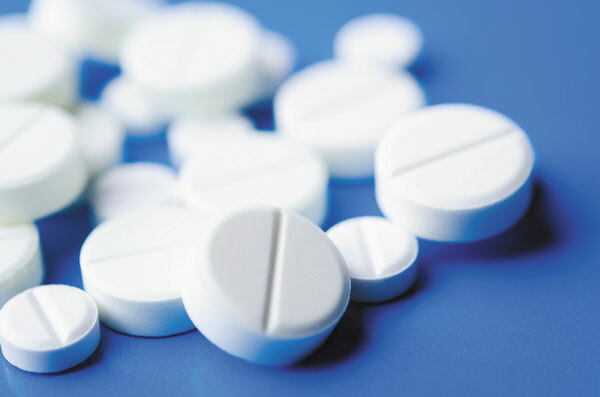 They noted that regular aspirin use—taking either a 325-mg tablet or an 81-mg tablet two or more times per week—was associated with a 3% reduction in cancers over all, although they saw no effect on major cancers like those of the breast, prostate, or lung. The researchers say the overall reduction was due mostly to a 15% risk reduction for gastrointestinal cancer and a 19% risk reduction for colorectal cancer. The study was only observational, and it doesn't prove that aspirin use prevents cancer. Still, researchers suggest that aspirin use may complement colorectal cancer screenings, and they speculate that it may even prevent almost 30,000 gastrointestinal tract tumors per year. That doesn't mean you should start taking aspirin without talking to your doctor first. Aspirin therapy comes with the risk of stomach bleeding, and in rare cases, bleeding in the brain. In April 2016, the U.S. Preventive Services Task Force began recommending that people who are 50 to 69 years old, have an increased risk of cardiovascular disease, and are not at increased risk for bleeding consider taking aspirin to prevent cardiovascular disease and colorectal cancer.